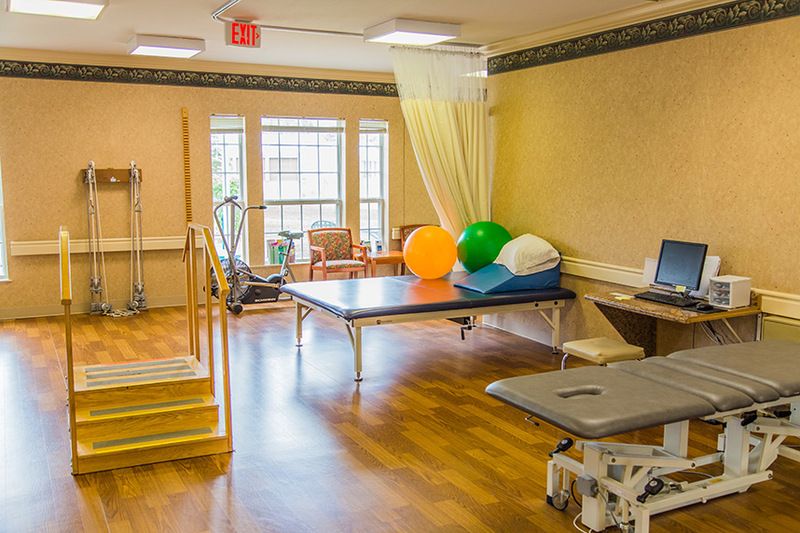 If you or a loved one are in need of health care, require advanced skilled nursing services and rehabilitation, then McCormick’s Creek Rehabilitation & Skilled Nursing is the choice for you. We provide excellent health care services in a homelike atmosphere and a partnership with the healthcare professionals who are dedicated to meeting your goals. You are at the first step in choosing a quality skilled nursing and rehabilitation center. Our objective in rehabilitation is to return each resident to their highest practicable functioning level. This often means a return to the community and/or a greater ability to function independently. Below is a list of many services provided by our licensed physical, occupational and speech therapists. In addition, we offer services using our state of the art therapeutic equipment to accelerate their recovery and their return home. We provide comprehensive inpatient rehabilitation using an interdisciplinary approach consisting of many techniques to produce the best results for that patient’s needs. Patients may receive therapy up to three or four times a day, five to seven days per week. Listed are some, but certainly not all of the conditions we can help treat. Our occupational therapy programs focus on improving residents’ ability to manage everyday living skills. Individualized programs maximize residents’ ability to re- learn basic living skills such as; eating, dressing, bathing, cooking, toileting and improve their functional mobility for optimum independence. We offer Physical, Occupational, and Speech Therapies to the community as an outpatient. If you or your physician feel you would benefit from therapy, a therapy referral from your physician is all that is needed to get started! Contact us today to find out more about what McCormick’s Creek Rehabilitation & Skilled Nursing can do for you! McCormick’s Creek provides both short-term rehabilitation and long-term care at the highest standards. We provide comprehensive skilled nursing care using state-of-the-art medical equipment and progressive treatment plans promoting quality care. McCormick’s Creek Rehabilitation & Skilled Nursing is proud to provide two specialty services to our community. Our goal in extending these services to the parents and children of the community is that it will give you more opportunities for continuing the care of your family closer to home. This is just one example of the services that we offer that shows “We Are Family, Serving Families”. LSVT BIG and LOUD : a specialized therapy program for those with Parkinson’s Disease. This program is designed to benefit those with Parkinson’s Disease. There are two parts of the program, BIG and LOUD. If you are interested in learning more about our Parkinson’s Therapy program, please contact our therapy team at 812-829-3444 to learn how to start a program. Our Speech and Occupational Therapists are also hosting a FREE monthly meeting for people with Parkinson’s Disease and their families. This event is FREE and they focus on what is important to o you and on exercise, socializing, and learning. These meetings are held on the 2nd Tuesday of each month at 4pm at 210 State Hwy 43 Spencer, IN. The therapy team at McCormick’s Creek Rehabilitation is happy to expand the scope of the community that we serve. Our staff members work as a team to develop individualized pediatric therapy programs to optimize development and address rehabilitation. The McCormick’s Creek Rehabilitation team is comprised of pediatric Occupational and Speech Therapists with the goal of improving the quality of everyday life for young patients with developmental and speech delays. We want each child to reach his/her maximum potential and it is our team approach and friendly environment that will help each child reach their goals. Our therapists are ready and willing to communicate with your child’s services at public school to provide continuity of services. We are available to serve your family during the summer months and can continue when school resumes if needed. If this program sounds like a good fit for your family, here is what you need to do. First, if you have any questions or would like to tour our therapy department, please call our therapy department at 812-829-3444. Next, visit or call your physician or specialty physician and request a prescription that refers your child to us for therapy services. The final step is to verify insurance. We accept private insurances and self pay for pediatric therapy services.